Thanks to AutoBlog.rs, the first photos of the Mercedes-Benz Concept Style Coupe — the preview for the upcoming four-door CLC Class coupe — have hit the web ahead of its expected unveiling in Los Angeles at this month's Transmission LA culture festival. With Mercedes-Benz now jumping on the "four-door coupe" bandwagon, we're treated to a concept chock full of stunningly sweeping lines that swoop from one end of the car to the other. At the front is a bold front fascia with angles running the entire width of the car. Basically, everything you expect from a concept from Mercedes-Benz. We'll really have to wait until we see the production car next year to know how much of those broad, sharp brush strokes make it into the final design. But, for the moment, it's not completely unfortunate looking — especially for something built off the same front-wheel drive small car platform that's birthed the A Class and B Class models. Although the base model will feature a turbocharged four-cylinder engine rated at 211 horsepower and mated to a seven-speed dual-clutch transmission (as well as provide an all-wheel drive option), the better news is that we'll eventually be treated to a high-performance AMG variant. 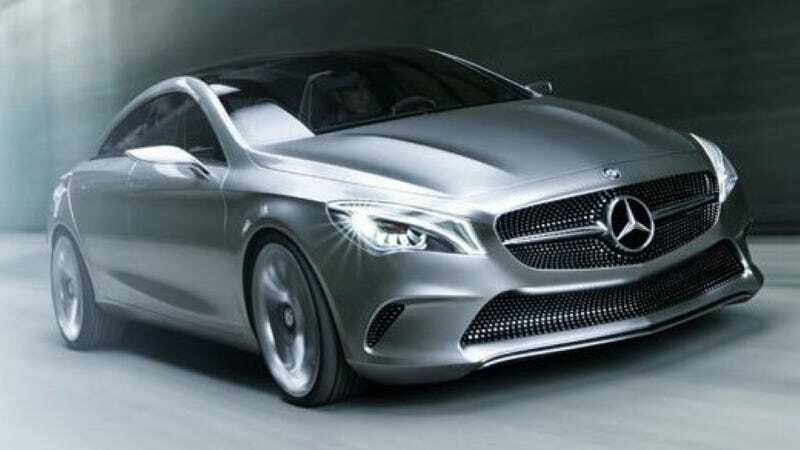 Check out the gallery over yonder to see more angles on this new "coupe" concept from Mercedes-Benz.